A muscle-up is a complex gymnastic and cross fit move. Done right, a muscle-up works your whole upper body. If you want to build muscle, it is the perfect move. The best muscle-ups are performed on the rings or bar, however note that it might take some time before you can do a few reps. This applies particularly to complete beginners. Before you get started, you should stand straight, just 1 feet away from the bar. Now raise the arms to an angle of 45 degrees. Make sure you’re not standing beneath the bar, as this will have a negative effect on your posture, and it might pose challenges when doing standard push-ups. Before lifting your body up into the muscle-up, you’ll have to generate momentum. This is done a lot better to do if you start at a 45 degrees angle. Now you can jump toward the bar. Use both hands to grab it with a false grip by keeping the thumbs onto the bar, rather than circling around it. Look at the bar as if it was a cliff’s edge. Do not hold it like a bottle, but grip it like you would hang from a ledge. Next, flex the wrists and make sure the hands are pointed inward. Your wrists and hands should sit right on the bar. A false grip eases the process of working out your upper body’s muscles. Swinging on the bar and leaping in motion should strengthen the body, supporting momentum. At this point, you should swing back and forth without letting the bar go. 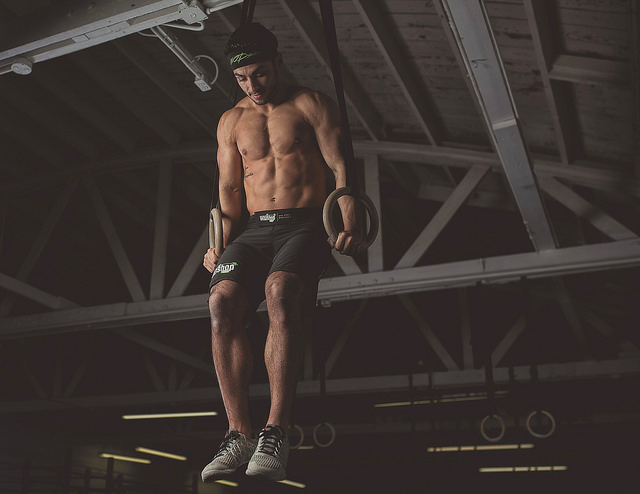 The muscle-up move starts when your body reaches the opposite end of your starting point. The move might seem like the kipping pull-up, which is actually the initial phase that introduces the muscle-up. If you’re a newbie, you may have to pull off through a few swings before gauging the right point. Get into the muscle-up following a couple of swings. After you feel that the shift in momentum as happened, lift the knees up and bring them to your chest. Just imagine yourself doing ab crunches. Kick the knees to compel the body to lean back; this will make things a lot easier for you when moving on the lifting part. You can easily do muscle-ups without lifting the legs, however it’s tougher and the benefits are not just as beneficial. When you lift up the knees, your chest helps you work out more muscles groups, including those in the lower body and abdomen. As you draw the knees up to the chest, lift the chin and try to go beyond the bar using your arms. During the lift, make an extra effort to go as high as possible. Your body might have to deal with some pressure, but look at the move as if it was a standard pull-up. After you’ve reached your desired height, drop down but without releasing the tension. Make sure your arms remain bent and elbows locked. If your swing is correct, you should see your legs swinging backwards. At this point you should be all set you roll over the bar. Make the transition from the pull up into a dip. Lean the shoulders in the front, over your hands. This will allow you to rise using your chest, and then rise above and beyond the bar. Feel free to kick out your legs or keep them bent. Both moves are correct. Do a complete dip, and then continue the muscle-up by pushing down onto the bar with your hands. Your body should naturally be driven upwards, and above the bar. Keep going until you’ve managed to get both arms fully extended, and above the bar. Take your time in doing so, and stay focused on bringing the elbows up, above the bar. Straighten the arms and tighten your core. Position yourself beneath the rings. Make sure you can lift up the arms and bend the elbows slightly so that you can reach the rings. As opposed to muscle-ups on the bar, there’s no need to keep your body at a given angle to build momentum. Rings are flexible, which means it’s much simpler to lift your body and not make a swing. Keep in mind that muscle-ups done on the rings is tougher than on a bar. Even though it’s simpler to build momentum, don’t forget that rings are not stable. You will have to control your body a lot better. After gripping on the rings, straighten the arms and make a swing kicking out the feet in the front. Hang on the rings, leaving the arms to support your entire body weight. At this point, your hands must be positioned above the head. Pull up your body using your arms. Your chin has to be at the level of the rings, or slightly above the rings. Draw the rings together and keep them close to your body and chest. To balance the rings, you may have to point out your elbows. 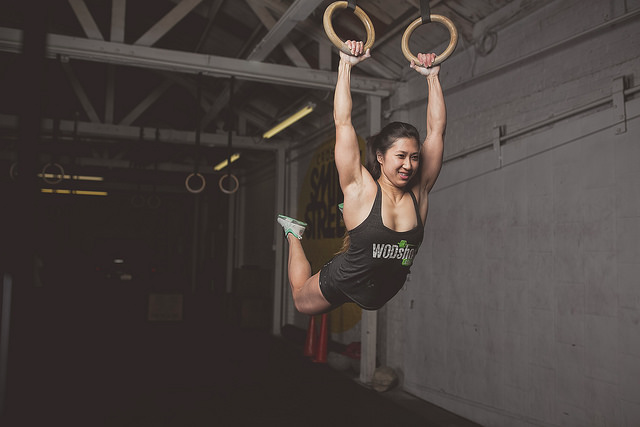 Doing a muscle-up, whether on the bar or rings, can be challenging to complete beginners. If you’re just starting out, you might want to stick to the bar at first. After you gain experience, you’ll have enough strength to move on to the rings. Also, for your body to have enough energy to endure such stressful routine, you should adhere to a nutritious meal plan, based on health supplements and proper food. This is fundamental to build muscle and preserve an excellent physical condition.